This post will explore the compelling combination of volcanoes and caffeine, and uncover the roots of the culture of coffee. Volcanoes can be costly. The Kilauea eruption of Feb 28, 1955 destroyed 21 houses, 10km of road, 4000 acres of sugar plantations and one coffee plantation: the damage was 40 million dollar in today’s prices. The cost of Mount St Helens was 1 billion dollar. Both events were eclipsed by Eyjafjallajokull: its price tag of 5 billion dollars was almost entirely due to the flight ban. Eruptions in poorer countries are cheaper, but can still cost the local economy hundreds of millions of dollar. Volcanoes may not be the most expensive environmental hazard (hurricane Sandy cost the US 65 billion dollar), but they are nonetheless a risky possession. But all volcanic damage is recovered by a single product. The world spends 90 billion dollar each year on coffee, a crop that for quality depends on those volcanoes. For developing countries, coffee is the second most valuable export (after oil, based on data from 2000. This statistic is often misquoted as coffee being the second most traded commodity in the world – it is about number 110 by this measure, still respectable for a snack.) Over 75 million people, many in rural, low income areas, owe their employment to coffee. But, just as you can’t make an omelet without breaking an egg, you can’t grow coffee without breaking a mountain. The word ‘coffee’ immortalises the kingdom of Kaffa. It was located in the southwest of current Ethiopia; the local people were known as Kaffichos. Here the coffee plant was first domesticated, sometime before 1300 AD. Southwest Ethiopia is one of eight areas in the world where agriculture was developed independently, and it has had some unique crops. For instance, ensete, a banana like plant of which the tuber is eaten, was domesticated here. From Kaffa, coffee cultivation spread north-east to Harrar. From Harrar the coffee plant was taken to Yemen. This may have happened as late as 1400 AD: the oldest known references to coffee drinking date from around 1450. It became used as a stimulant, and the growing of coffee bushes spread rapidly in Yemen during the 15th century. The rest is history! The plant family which includes coffee is found in tropical Africa, Madagascar, the Comoros, and the two volcanic islands Mauritius and Reunion which were seeded by plants from Madagascar. The genus ‘Coffea’ contains 125 separate species, most of which are evergreens hiding in humid tropical forests. Only three of the species are used for coffee: Coffea canephora, Coffea arabica and Coffea liberica. Coffee is now grown on every continent, except for Europe which is too cold and Antarctica which is even colder. Coffea arabica accounts for over 60% of the world’s coffee. It is a natural hybrid, but the parentage is a bit uncertain. 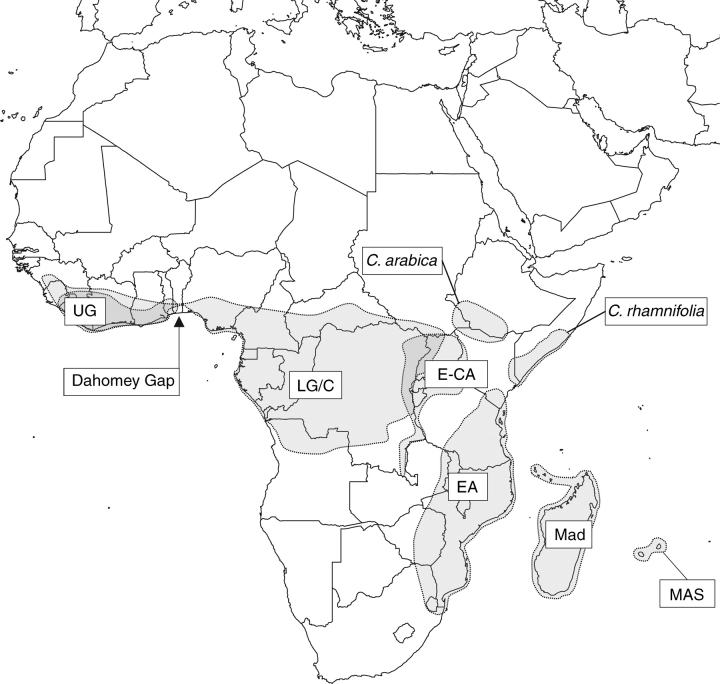 One parent is probably C. eugenioides (a rather variable plant from the highlands of Rwanda, Uganda and Kenya), but some genetic evidence suggests a closely related but different species, perhaps C. brevipes (Cameroon) or C. anthonyi. The second parent is probably C. canephora, but may also be a related species such as C. congensis. 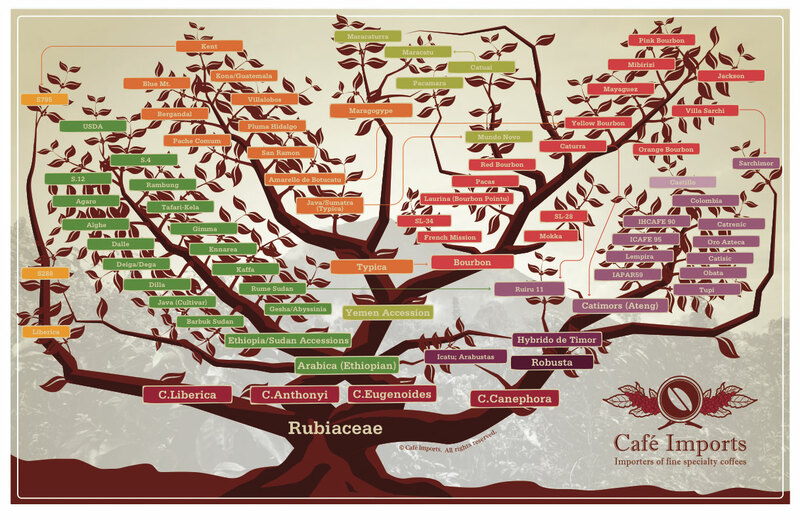 C. arabica has limited genetic diversity, and the hybridization may have been a relatively recent accident which happened only once. Coffea arabica is self-pollinating and therefore malleable. Selective breeding over more than 500 years has yielded many different varieties. However, the plant is not particularly strong, perhaps because of the lack of genetic diversity and selective breeding, and can suffer badly from disease. A major outbreak of the coffee rust fungus in Indonesia wiped out much of its arabica plantations in the late 1800’s. C. canephora, at that time known as C. robusta, was found to be a much stronger, disease resistant plant, and was planted instead. It produces a lesser quality coffee. Coffee made from C. canephora is still known as robusta coffee. The Indonesian tests also found that C. humilis (a dwarf species from the Ivory Coast) had a very good, sweet coffee bean, but subsequently this plant disappeared from the test collections. Typica. An arabica, originally from Yemen. Very popular and widely grown. Famous varieties include Kona and Blue Mountain. All Typica varieties are believed to have come from one or two plants grown in Amsterdam in the early 1700’s, which were subsequently taken to Indonesia. Bourbon, Another arabica from Yemen. It spread to Central America via Reunion where it was imported in 1715 (Reunion was called Ile de Bourbon at the time). It has a somewhat higher yield than Typica. Ethiopian varieties. There are a large number of local varieties, which can be difficult to get hold of. Robusta. These can withstand high temperatures and are grown at low altitudes in the tropics. There are several named varieties but the product is normally just sold as robusta coffee. Liberica. These coffees are not widely produced, in part because the C. liberica plant is inconveniently large (an 18 meter tall tree) and in part because liberica is not as good a coffee. Barako is a liberica coffee from the Philippines. From these five types stems a rich variety of coffees, some excellent, some with an impressive name, and a few with both. Blue Mountain is a well-known Typica (arabica), grown in Jamaica. Colombia is a hybrid robusta-arabica originally from Timor; the robusta parent makes it suspect to some afficionados. Red Bourbon is not surprisingly a Bourbon (the colour refers to the bean: other colours also exist). Peaberry is not a particular variety but a bean shape: coffee cherries normally contain two beans. About 5% (the peaberries) have only one, and the bean becomes rounder as a result; double beans are flattened on the facing sides. Robusta can be grown anywhere with a tropical climate. C. arabica is more picky: it is a tropical mountain plant, growing above 500-1000 meters, which demands cooler temperatures of 15-25C year round, with cool nights. A rainy season is needed in the growing and flowering season: 150-200mm per month is good. But the fruiting requires a dry season lasting three months. Frost is devastating to either plant. The map below depicts the ‘bean belt’, showing where robusta and arabica (or both) are grown. The locations where C. arabica is grown coincide with regions of volcanic activity. Non-volcanic regions mainly produce robusta. Arabica is the phoenix of the floral kingdom: it thrives on volcanic soils. As a forest plant, C. arabica likes to have shade and shelter. Banana plants are excellent for this: their large leaves provide shade (they also make good fertilizer), and the farmer can sell the bananas to supplement the income from the coffee. In Uganda, government advice is: take care of your bananas, and your bananas will take care of your coffee. However, large plantations often grow coffee in direct sunshine to maximise yield. C. arabica is a small tree, but for ease of harvesting is normally kept as a bush. A new plant will take 3-4 years before it first develops small white flowers. The fruits, called coffee cherries, take up to 8 months to ripen. Eventually, they change colour from green to dark red and the harvest begins. Maddingly, each cherrie ripens at its own rate, necessitating checking the tree every 8-10 days with labour-intensive manual harvesting. The plants provide the highest yield when around 15 years old. The productive life is 25-40 years. The bean is within the fruit. The flesh of the fruit can be removed by letting the fruit dry out in the sun (dry processing) or making the fruit rot in lots of water (wet processing): the latter is used mainly where the local climate lacks a dry season suitable for sun-drying. One type of wet processing even lets the fruit be eaten by animals and collects the beans from the fertilizer coming out at the other end – a coffee with curiosity value but do wash the beans well! After wet processing, the remaining beans still need to be dried in the sun for a couple of weeks. Finally, the papery skin of the bean is removed, leaving the green coffee bean. The beans are shipped to the coffee company and roasted. The roasting dries the bean further, breaks the shell and releases aromatic compounds from the kernel. Each roast has its own temperature and duration. A strong (dark) roast, at high temperature, will suppress the original taste of the bean. Arabica beans, with a more complex aroma, are normally lighter roasted. Robusta beans tend to benefit from a darker roast. However, many darker roasts do use arabica beans to good effect. Starbucks is particularly known for its dark roasts. Too light a roast can leave a sour taste. Immediately after roasting, while the beans are still warm, flavoured oils can be added. Some afficionados will consider this ‘bad taste’. After roasting the beans are finely ground, either in the factory or at home prior to brewing. Ground coffee begins to lose its taste quickly and cannot be kept for too long: for shipping it is vacuum-packed. The roasted coffee beans are edible, in moderation. More than 10-20 beans puts you at risk of caffeine poisoning, and be aware that coffee beans also contain cholesterol. Healthier is to extract the flavour from the beans into a drink. The principle is easy: bring hot water into contact with the ground-up bean and serve the liquid. Basically, there are three ways to achieve this. One is to pour the hot water directly on the coffee grounds, either in the cup (drink with care) or in a cafetiere. Second, force steam at high pressure through the coffee grounds, producing less liquid but very strong coffee: espresso (the name refers to the high pressure). Third, percolate hot water through the coffee using a (paper) filter: filtered coffee. Each their favourite! Many variations are possible. Milk or cream and sugar can be added to taste. Dilute an espresso with hot water and you get an americano, large, with an unsubtle taste, the Donald Trump of the coffees. The creamy layer on top of the liquid retains some of the aromas and the trick of making coffee is to keep this intact. The taste of the coffee depends on the quality of the bean. For the strongest coffees robusta is a common choice, but even for espressos the bean makes a lot of difference. Coffee filters can remove some of the aromas. On the other hand, people who need to control their cholesterol may want to stick to filtered coffees as the paper also removes some cholesterol-inducing compounds. include severe headaches which can last a few days. Cheers! Over 800 aromatic components are known in coffee. Most of the taste comes from about 20 of these, including vanillin and methoxyphenol. Caffeine itself has a bitter taste, which is very notable in robustas, and in strong coffees (especially Italian espressos). Instant coffees (made by freeze-drying) are also bitter. Several other compounds of coffee, such as quinic acid and trigonella, contribute to the bitterness. (Excessive quinic acid is the main cause of the bad taste when coffee is left on the heating element for too long.) The taste of coffee comes not only from the liquid itself, but also from the aromas which enter the nose, either directly or using the back route from the back of the mouth into the nose. Arabica is more aromatic; robusta coffee less so, leaving the bitter taste to dominate. The most complex taste comes from acidic components, such as malic acid and formic acid; these are especially strong in coffees grown on mineral-rich volcanic soils. Coffea is a hungry plant which needs fertile soil. One 60 kg bag of coffee beans contains 1 kg of nitrogen, 60 g of phosphorous, 9 g of potassium, 16 g of calcium, 90 g of magnesium, 7 g of sulfur, 1 g of boron, 0.8 g of copper, 3.5 g of iron, 1 g of manganese, 0.002 g of molybdenum, and 0.7 g of zinc (www.coffeeresearch.org). All this has to come from somewhere! In rich soil, one coffee bush may produce 6 kilograms of beans per year (1200 cups of coffee), rich in aromas. A poor soil will yield very much less, and give a coffee which lacks taste. Coffee planted in poor soil is also more susceptible to disease, and requires pesticides – a bit ironic since the caffeine is itself a pesticide. The importance of soil can be seen by comparing Java to Borneo: they have the same climate but Borneo is geologically old and lacks the rich volcanic soils of Java. Coffee is a major crop in Java whilst Borneo has little agriculture – and no coffee. In tropical regions, the heavy rains quickly impoverish the soil. This will not do for coffee. The soil needs to be rejuvenated, either by flooding (alluvation), glacial sediments, or volcanic ash. Glaciation would be surprising (putting it mildly) for the tropical climate which coffee needs. Flooding is a low-land process, and is important to robusta but less so for the mountain plant C. arabica – which also tends to die off in water-logged soils. This leaves volcanic ash as the main natural fertilizer. Soils derived from volcanic ash deposits are called andisols. Andisoils are normally light, easily tilled, and hold a lot of water: all excellent for coffee. Volcanoes provide some further side benefits. They increase the elevation, good for C. arabica which is a mountain plant. The cone-like, isolated shapes attract rain, so that the slope (at least on one side) tends to be wetter than the surrounding land. Finally, C. arabica hates wet feet: volcanic soil does not become water logged (unlike clay), and furthermore, the slope of the volcanoes improves the run-off and therefore the drainage. The optimum slope is around 15 degrees. The combination of altitude, drainage and slope, richness of soil and a tropical climate is volcanic dynamite. Coffee can be grown elsewhere, but the best coffee is grown on volcanic soils. Ashes to coffee grounds. But within reason: too much ash can badly damage or kill coffee plants. Coffee lives in a constant conflict between the need for volcanic eruptions and an inability to survive them. Ethiopia remains the heart of coffee: the origin of Coffea arabica, the location with most genetic diversity (perhaps as many as 4000 distinct varieties) – and where it is valued most by the local population. Half the coffee grown in Ethiopia is consumed locally; still, coffee accounts for 40% of all of Ethiopia’s export earnings (before 2000 it was as high as 70% but other export products have since grown in importance). The beans are roasted at home using a flat iron pan, ground, and boiled in water for 15 minutes. An intricate ceremony can be attached to drinking coffee, including burning of incense. Sidamo (the southernmost province of Ethiopia) is particularly famous for the best-known export, Yirgacheffe coffee. Sidamo coffee has a complex, citrus-like but mild taste. Lekempti, from the west, is sweeter and lacks the citrus acidity. Harrar coffee, grown in the east of Ethiopia, is often used in espresso blends. It can have a blueberry-like aroma, and is used to add taste to the espresso mix. Unusually, Harrar coffee is grown under desert conditions. The Ethiopian forests where coffee grows wild are rapidly disappearing under the pressure of a burgeoning population. This puts in danger the genetic diversity of the wild plants, an essential resource to combat future coffee diseases. A UNESCO Biosphere Reserve is helping to protect some of the remaining mountain rain forest. Harrar coffee is grown close to Ethiopia’s most active volcanoes, which are found in the Afar depression. The other coffee-growing areas, towards Kenya, are closer to the rift valley and aided by the volcanoes found there. Of the nearly 60 volcanoes identified in the rift valley, at least three have been active in the past 10,000 years. Corbetti erupted around 400 BC, and Aluto perhaps 2000 BC (recently the latter has shown inflation). The ash from Ethiopia’s rift volcanoes fertilize regions well away from their immediate vicinity. Ethiopian coffee is a living gem, evidence of Africa’s volcanic heritage. If Ethiopia is the heart of coffee, Yemen is the mind. The volcanic soil of the Yemeni mountains has been used to grow coffee for over 500 years. There are many local arabica varieties, closely related to those grown in Ethiopia, but each one is subtly different. Coffee is grown mainly in the mountains in the west of the country, surrounding the capital Sana’a. The mountains here have a number of eruptive volcanoes. The most recent eruption was in 1937, in a 3500-m high volcanic field called Harras of Dhamar. The coffee cherries grow during the summer rains, and dry in the autumn when the desert reclaims the mountains. Ethiopia and Yemen carry almost all of the genetic variability of Coffea arabica. Elsewhere, coffee plants are genetically rather uniform. All Tanzania’s volcanoes are surrounded by arabica plantations. Famous Mount Kilimanjaro is the centre of the coffee growing region of Moshe, which also contains Mount Meru and Ol Doinyo Lengai. Mount Meru last erupted in 1910, and Ol Doinyo Lengai is currently active: this is the volcano which fertilises the grasslands that make the wildebeest migration possible. If the rite-of-passage climb of Kilimanjaro proved too much, a local coffee tour could still give the expedition a taste of success! Coffee growing regions in Tanzania. Source: wikipedia. The Moshi region has fewer than 200,000 people, and is poor, with little infrastructure and poor roads. As you may expect from a coffee-growing region, there can be a lot of rain. Traditionally, the local Chagga people grow the coffee bushes in shade, underneath larger trees. Starbucks is reported to be a major buyer of their coffee. However, most of the coffee is grown on plantations, which are replacing the local coffee varieties by ones that tolerate sun and have better resistance to fungi. A second volcanic region in Tanzania is in the southern highlands, north of Lake Malawi, with Mount Rungwe the best-known peak. It probably erupted a few hundred years ago. Away from volcanoes, arabica is also grown in the Matengo highlands, east of Lake Malawi, and next to Lake Tanganyika in the Great Rift Valley region. The main robusta growing area is to the west of Lake Victoria. Guatemala has the reputation of producing some of the best coffees in the world, and some of the most expensive. What to expect from a country as littered in coffee plantations as it is in volcanoes? Coffee is grown above an altitude of 500 meters, but needs protection from frost at higher levels. Almost all coffee is shade grown: the trees create vibrant eco-systems where the natural insects and birds (and the caffeine content of the plants themselves) reduce the need for pesticides. The central coffee authority (Anacafe) recognizes eight different Guatemalan coffee regions: Acatenango, Antigua, Atitlan, Coban, Fraijanes, Huehue (producing the world’s most expensive coffee), New Oriente and San Marcos. Five regions are known as volcanic and those are Acatenango, Antigua, Atitlan, Fraijanes and San Marcos. This leaves Coban, Huehue and New Oriente as non-primary-volcanic regions. Coffees from the volcanic regions are normally slightly more mineralized in flavour compared to the non-volcanic. But this is not the full story. All parts of Guatemala are now and then dusted with volcanic ash, and not a single region has avoided being covered in deep blankets from massive eruptions from Amatitlan and Atitlan. So, in a way the non-volcanic regions should be known as semi-volcanic regions. This leaves foremost Huehue with a beautifully balanced coffee that has taken center-stage as the best coffee known to humankind. In Europe or the US a kilogram of El Injerto Huehue coffee can cost as much as 1,000 USD. Rather than paying this, Carl (our Guatemalan coffee expert) recommends spending the money on an air ticket, to visit El Injertos cafe in Guatemala City in person. A cup of their fabled coffee will be produced for you by an expert for as little as 7 USD, and that cup will be, in comparison, even counting a reasonable cost for the flight, the cheapest cup of coffee you ever had. Take your cup and go out into the street. If you are lucky you will see Pacaya or Fuego happily puffing away the ash that gave your cup its taste. Indonesian Java Moccha coffee used to be famous. The coffee seeds were brought here from Yemen, and production grew huge. But coffee rust wiped out many of the plantations. A large research project was started to improve on the Yemen varieties. C. canephora, known as C. robusta, was found to be disease resistant, and robusta coffee was born. But although it worked miracles for the disease resistance, it was less wonderful for the quality. Some arabica/robusta hybrids were developed, but again these did not come close to the best coffees. Coffee plantations in Indonesia also regularly suffer from too much ash from its overactive volcanoes. In consequence, Indonesia is still a major coffee producer but now supplies mainly the less demanding markets. It is often used in instant coffee and in espresso mixes. Sumatra coffee is affected by a lack of iron in the soil. Some arabica is still grown, and the best coffee comes the highlands around Lake Toba. The Tambora region also grows coffee. Archeology has shown that coffee growing here began before the 1815 eruption. Hawaiian Kona coffee is grown on the western slopes of Mauna Loa, between 100 and 800 meters above sea level. This is a lower altitude than usual for coffee, aided by the tempering effect of the coolish ocean. The Mauna Loa area is known as the Kona Coffee Belt; it is about 50 kilometer long but only two kilometers wide. Only coffee grown in this specific area is allowed to be referred to as Kona coffee. Kona coffee was originally derived from Guatemalan varieties. Rainfall in the Kona belt amounts to about 1500 mm per year. Most falls in the afternoons. There were very few pests found in this region, but regrettably the coffee-berry-borer beetle has recently arrived on Hawaii. Kona coffee is a smooth, light, excellent coffee, but known especially for its price. If you can afford it, go for the pure Kona coffee. Blends are a bit cheaper but may contain as little as 10% Kona beans. Much better to spend the same amount on a bit less, and enjoy the real thing. Try the Coffee Shack, along highway 11 on the Island of Hawaii in the Kona belt (pick a quiet time and go for coffee rather than lunch). It looks like a shack from the front but the views from the terrace are breath taking. Coffee viewing at its best. Vietnamese coffee is best avoided. Brazil produces 30% of the world’s coffee. 75% of its production is arabica and 25% robusta. Brazil bourbon is well known. Coffee is mainly grown in the south-eastern states, especially around Sao Paulo. Occasionally, severe frosts devastate plantations and necessitate large-scale replanting. Because almost a third of all coffee comes from Brazil, this can cause major price fluctuations. In Brazil, quantity has at times ruled over quality and the product is often sold as blends, mixing the good with the bad. And dare I mention a lack of volcanoes? Coffea arabica is a fragile flower, the diva of agriculture, which will only perform if provided with a stable climate, cool tropical temperatures, rich, well-drained soil; the kind of plant for which paradise was invented. Volcanoes give it everything it wants, minerals, drainage, microclimate. Here is the paradoxical plant that wilts in heat but lives by fire. Other coffees are less picky, grow anywhere, have higher yields, but like non-volcanic mountains, lack excitement. Spoiled arabica remains the top performer. And in return, this picky plant provides more development aid than any western government ever has, provides a living for poverty-afflicted regions, and pays for any damage ever done by any volcano. Not bad for a bean. Thank you! I like to see volcanoes as building more than they destroy. And coffee is a gift. A fascinating article, Albert! Thank you! I’m showing this to my wife who is a coffee aficionado and visited coffee plantations in Guatemala three years ago. Just had a cup o’ Sumatran this AM.. Thanks Albert. Coffee one of the ‘silver linings’ of a volcanic eruption. 🙂 I’m more of a tea drinker, because coffee irritates my stomach, even with decaf. But I just have to have coffee with a pastry & just love the smell of it. Ref Japan quake: Some are confused by the tectonics. Interesting swarm around Virginia City, Mont. I was curious about this area & looked on google earth. I noticed Baldy Mt nearby. I’m definitely not an expert & not suggesting anything, just found this interesting on what wikipedia has. big fire there back in the 90’s ..
What’s up at Vatnafjöll? I note a flurry of small quakes, all at 6-7 km deep. Vatnafjöll is part of the Hekla-system. Reminiscent of the Hekla swarm in March 2013? A little bit west of where the 2000 event started… But is seems to be along that track. I think this is the drumplot closest to it. Are those tornillo’s in there? May or may not be quake-related – but does anyone have a link to an alternate feed for that camera? Aso seemed calm but note the activity on Iwo Jima. Not good. NDVP#1 twitching? Not good at all. I see they list an evacuation warning for Kuchinoerabujima, south of Kyushu. Is that old info? I wonder if anyone can tell me why the Haukadalur station has such a strange reading? https://snag.gy/PKBXeD I’ve looked at these enough times but never seen one quite so flat. Is it a fault? I’d love to know what interference or setting has cause this appearance. Thanks! It still has a noise floor, so it’s sensor is reading something. A flat-line would be bad news. For the tech that has to go out and fix it. get him badly. Well one day recently my dog got out. “biz” to my dog’s irritation. The other dog saw him coming,started home, and my dog cut him off. down and makes for his porch, my dog is after him. The other dog stays on his side of the street. Had a similar incident when I was younger. The caveat was that the free range dog had beaten my dogs brother up quite bad in full view of my dog. A year or so later, after a series of fence marking right in front of him, one day my dog got out. I had never seen the grace of a full on charging doberman until I saw him plant on the other dogs throat as he clamped and pivoted across the top of him at speed. Immediate retreat was in order… but it took me several minutes to get him off the other dog. Both survived, but it was a bloody mess. Btw, between the two brothers, my dog was the alpha of the pair. Every morning they would head down the hill in back and discuss the matter. From then on out, the free range dog gave our yard a wide berth. Btw, I am still a great fan of the doberman breed, but you need to have plenty of room so they can stretch out and run. Its what they are good at. At the time we had a fenced acre or so anf the dog would lap it two or three times before he was ready to come back in. Oh, and a six foot fence is probably too short. They will figure a way over it. Love the humor! “not applicable if the subject has died” Yeah, a bit dark, but funny! For coming from a plant that is hard to grow and Labour intensive coffee is incredibly cheap. Now you might say that it is due to a huge production rate, but that is not true. It is due to extensive use of underpaid coffee-workers. Even though Guatemala has expensive coffee ranging from 4.5$ dollars to 150$ if you buy straight off the farms the workers are underpaid. A normal salary is about 150 to 250$ per month. Now remember that this is from a part of the world where the coffee yields at least twice the going market price for Arabica. Just imagine what you would get paid in the low paying areas. This is also the reason why coffee-plantations tend to disappear as soon as the economy of a country grows. It will after a while not be possible to find cheap enough workers to be able to compete on the world market. Guatemala addressed this issue by raising the quality of the coffee and making it sustainable. But few markets will be able to compete with Guatemalan coffee in this way. So, in a few years it is projected that our favourite drug will rise in price quite steeply as coffee-consumtion continues to increase and coffee production falls off (minutely). So, expect your coffee to be 20 percent more expensive in about 5 years. It will still though be ridiculously cheap per cup if you brew it yourself. And, whatever you do, stay away from that horrible pod-coffee. It is bad coffee and it produces mountains of discarded pods (about 1 billion of them per day). Just a simple coffee-brewer with good temperature control and you will get the best coffee. No need for all that new-age coffee crap in the ways of producing it. If you want really fancy coffee, go to a real Barrista who knows what he/she is doing. Uhm, and foremost. Stay many many miles away from Starbucks, that is not coffee they are serving. This is very true: coffee provides employment for a lot of poor people, but it does not make them rich. It is probably a healthier occupation than some banana plantations which require too many chemicals, and can be very good for communities. But when the economic benefit of coffee is calculated, it does not show well who actually benefits most. It varies per country. There is a problem with overproduction of coffee, for instance due to the rapid growth of coffee growing in Vietnam. If you want to do your bit for a particular part of the world, you can buy coffee from tat area. Most general brands will be a blend which includes Vietnamese coffee, because it is cheaper. Coffee pods are a mixed blessing. You can find coffee makers that use a different, similar to tea bags, and do not produce those unrecyclable mountains. Worth considering if you care about the waste you produce. If you drink coffee only occasionally, coffee pods may be fine (though expensive). If you drink more than one cup a day, the waste adds up. I’ll refrain from commenting on starbucks! I won’t. In our CPO mess, we excoriated the GMC for fouling our coffee urn with some fruity arsed Starbucks like flavored crap coffee. That is some seriously over priced, favored oil pan sludge. If your a fan of Starbucks, well, good for you. At least your trying. Now go find yourself an actual cup of coffee, it will make you much happier. I buy coffee from a fair-trade cooperative. As well as adhering to fair-trade principles, they return profits from retail sales to the growers, it’s not exactly a recipe for building a large business – it’s effectively a charity. Price per kg is the same as anywhere else and quality is good – so it’s not costing anything extra to buy “ethically”. The large multinationals engage in what looks like “greenwashing”, they make claims about supporting fair-trade, sell some premium product sourced and labelled as such, but it’s only a tiny fraction of the total trade they they dominate. We make espresso at home, some investment is needed to get results. A good quality grinder is essential, then for espresso machines, with high temperatures, steam/water, pressure, it’s a bad environment for reliability of electrical/electronic components. I haven’t had much luck in the past with longevity of home appliance branded espresso machines. Home espresso machines made using commercial components are available at a price, they’ll still need servicing over time, but are built to last. Scientists think they can now tie the disruption that hit Mayan civilisation in the 6th Century to an eruption of the El Chichon volcano. A Dutch team has investigated ash fall deposits, finding the age of the materials to be a good match for the so-called Mayan “hiatus”. A sulphur spike in ice core records from the poles indicates there was a big eruption somewhere on Earth in AD 540 – right at the start of the multi-decade hiatus. Then we just have to find the AD536/537 eruption. I too had thought it somewhat of a foregone conclusion that Llopango was the culprit. There were 2, possibly 3, eruptions n close succession, according to the ice core record. So there is room for discussion. One was probably tropical and one was northern hemisphere. El Chicon may have been the third? As was found in 1982, El Chichon’s magma has an abnormally high sulfur content, so the ‘footprint’ of sulfate traces may be bigger than expected for the total DRE, perhaps? Possibly, definitely. But the dates of the Llopango are well determined so it contributed and it was a very larger eruption. El Chicon seems less certain, looking at the information in the press today. I have been pondering the northern eruption. We know it was not Icelandic and we know it was not as far as we know Alaskan or US Continental. Instead the Northen eruptions large sulfate content seems more to point towards one of the hotspot driven northern ones. And if we rule out Iceland that pretty much leaves us with only one likely culprit. Jan Mayen is a hotspot high in sulfate emissions and it is very poorly known. We tend to only think about the heavy hitting Beerenberg and the more effusive Sör-Jan volcanoes, but you have quite a few subaqueous volcanoes to that could have stood for an eruption too. But it is obviously not impossible that Beerenberg could have belched out a big one around that time. Now, I am not into poking my neighbouring countries in the eye, but the Norwegian combined knowledge about volcanoes is pretty much to be found among our Norwegian readers in here. There are just no good volcanologists in Norway, so there has not been a lot of science done on the Jan Mayen hotspot and it’s volcanoes. In a more sane world the Norwegians would have hired a couple of Icelandic ph.d. students to go and poke about for a year and we would know quite a bit more. But, since Jan Mayen is a military installation that will not happen. The sulphur haze lasted 15 months and affected the middle east, europe and china, at the least. Many references to ‘dry fog’ but looking at the original documents, that seems incorrect. A dry fog is ground-level haze, and that would have required a long lasting effusive eruption. All reported haze was high altitude. This event could well have been explosive and brief. Interestingly, the chilean records are claimed to also show the long duration of the event, almost to 550. That would suggest the second eruption wasn’t that far north either. I need to dig further. Not enough known. I think I tentatively have the culprit now. The time and extreme length of the eruption combined with hotspot origin limits the numbers drastically. Say hello to the Hannon eruption of Mount Fako (Cameroon). It is named after the Carthaginian navigator Hannon. It started in the fifth century and lasted into the mid sixth century. The eruption was continuous but suffered from interludes of highly intensified lava production, especially the end phase produced large volumes of magma. It is rated as a VEI-3, but the total effused volume is well into the 10km3 range and changed the coastline drastically. Todays Bakingili Beach is ash deposits on top of the magma of the Hannon eruption. It is the only likely long term erupter I can come up with that could have produced a large enough SO2 spike for that amount of time. Addendum: The other culprit could be the original formation of the Dom de Joao de Castro Bank in the Azores. But almost nothing is known about that climactic eruption, and only a bit more is known about the second island forming eruption. My point here is that we have a long duration eruption with high sulfate/no ash record. That leaves us with a hotspot/mantleplume origin. And there are not that many places that fill that prerequisite. We are stuck with the Azores, Canary Islands, Cameroon or the Afar Region Volcanism. Problem is that neither of these are that well researched. Nobody seems to give a rats fig about Azores and Canaries volcanic history prior to the colonization era. Cameroon and the Afar is not high up on the list for budding volcanologists either. But, the culprit is most likely to be found somewhere here realistically. If anything, the northern so2 cores would imply that there was no large eruption in this time period. Somewhat surprises me, but the data is what it is. Do you have a separate source for the large sulfate record? Interesting feature underwater south of Sao Miguel,Azores, anyone enlighten me? For ice sulphate records, I tend to use Sigl’s paper nora.nerc.ac.uk/502097/1/jgrd50082.pdf Indeed, the sulphate spike is some ice cores is not that high for this eruption, but others are strong. Larsen (2008) finds that the sulpur deposition was 40% larger than that of Tambora. He also suggests that the second eruption in this time was from a japanese volcano, Haruna, erupting just before the main event. And if the person in front of you orders a hot weak decaf soy latte, make sure you look at them funny and then order a expresso! Your Barrista will thank you! This may well be the eruption which had the worst effect on humanity. The 535AD eruption gave two years of very bad weather, at a time when food was not stored for coming years and a third of the harvest was needed for planting the next crop. It was a lot worse than Tambora. And when the world was beginning to recover, there was a second eruption in AD 540, of similar size. It cannot be a coincidence that the first recorded outbreak of the plague started in 541 AD, as bad as the black death of the later middle ages. If you would make a list of the most devastating eruptions in history, this double whammy would be top of my list. Toba would be my second – even though a much bigger eruption. I will say, Rabaul seems like the most likely source of the 540 ad eruption. I would personally be suprised if El Chicon played a big role. Second, the 535 eruption must have been from Llopango, which was almost certainly a VEI-7 sized event. It’s just too perfect of a glass slipper to be anything else. Actually never 1/3 of the harvest. Yields in those days would have been circa 3T/Ha and the max seedrate would have been under 250kg/ha. Today yields in europe would be 9+T/Ha with a seedrate of 150kg/ha. However variability would be high with crop failures common and yields in a failure (weeds, diseases, weather) situation could be sub 1.5T/Ha. This was a number I found for northern Europe in the middle ages (around 1000 AD). It didn’t say what it was based on. Buckwheat perhaps. Harvests were highly variable, as you can deduce from annual food prices. (Althogh records may be better for the price of wine than that of wheat.) Very weather dependent. Two poor years in succession ensured famine. It takes much less than two years to cause famine. Its just that those dying don’t get much of a say. The biggest salvation of the middle ages was very low population densities and vast numbers of livestock. Livestock eat grass, and grass pretty well always grows and does not particularly depend on critical harvest conditions. Consequently livestock can eat failed crops and actually survive quite well over winter on starvation rations. ‘Foggage’ (ie the remains of headed pastures left to go to seed in situ) can keep animals goi quite well. Today one year of failed harvest worldwide would pretty well destroy westen civilisation as we couldn’t begin to ffed our populations. I suspect theMaya, when the failed harvests came, depended on 100% arable production over the whole farmable area because populations had grown to the limit they could sustain. Failure meant a breakdown of society, which is what we see. I decided to watch it. There’s part of a movie that’s first shown. It is not what it continues to be. It stops & says continue watching full movie. It’s actually a docudrama. I thought it was good. For whatever it’s worth, I think this link above should be bookmarked somewhere on this site. Probably one of the best resources to have when looking for eruptions and important markers. I noticed something I wanted to share due to the somewhat recent Grimsvotn series. Below, the left column marks the years before 1991. The right column is the volcanic So2. For scale, Tambora had an output of roughly 100 on this scale, although it’s a southern hemisphere volcano, so probably didn’t register as much on this scale as something like Grimsvotn would have being right next to where the cores were taken. Either way, I found it somewhat interesting how you can see two big eruption spikes with the 311, and then the rather large 480 mark. I wouldn’t be surpised if the 10285 year marked the start of the eruption that occurred around then, with so2 not hitting entirely during that year, but hitting a peak around 10284 or so. That gives us two punctuated (and likely explosive) eruptions that probably hit over 400+ in volcanic atmospheric so2. Note: I was initially looking through this data in relation to the 535 eruption. Surprisingly, there is pretty much no so2 marker for this time period, so I’m left thinking there may not have been a large explosive eruption in this time period, but Carl’s effusive model makes a lot of sense. Note that the effusive eruptions like Laki do not produce notable markers in the so2 data in ice cores, but they do seem to be capable of affecting the weather. I think some of this is likely due to effusive eruptions not being able to push sulfate high enough into the atmosphere, although they clearly have been known to produce lots of dry fog in large enough events. Tambora was not the number of around 100 (I think that is the 1835 eruption, unknown but northern volcano), but the one of around 33. The 1258 eruption and 535 are rather weak in this list. A few things to nore: The distance to the pole is very important in the amount of SO2 deposited. So is weather: less snow in greenland means less deposited SO2. Greenland is not very sensitive to icelandic eruptions because it is upwind, but if the winds are from the east, an eruption in Iceland can dump a lot. If you go far back in time, ice layers become very compressed and hard to distinguish, so peaks appear to broaden. The record for that first 100+ record is dated at 167.69 years before “present”. The problem, is that “present” in this table is 1981 (part of why I’m not a fan of using years BP, and think they should just use B.C. as a scale). You’ll notice that the top of the table has year as -35. Accounting for this, the time period for this record is precicely in 1914/1915, so this absolutely has to be Tambora. All in all, in order to get more accurate dates for this table, you need to add 35 to any of the years bp records, then subtract that from the current date to get the proper time. With that said, interesting to learn about the ice layers compressing and the effects of snow. Can this potentially skew records so that the sulfate records seem to spike lower, but over a wider period of years (similar to what we saw at Kikai)? You are right, I had missed that. ‘BP’ is a pretty useless notation as the zeropoint is randomly chosen. It is not as randomly chosen as people believed. The date needed to be before we had the larger spills of nuclear material in the air and for historical reasons it needed to be a pretty uneventful year that was easy to remember. So, they decided upon 1950 since it pretty much filled all the checkboxes. And another anecdote I noticed when looking through the data on the Greenland So2 that I missed previously. When looking for large so2 volume, often for the bigger eruptions, the so2 levels are high for two separate time markers. This would indicate that time it took for the aerosols to filter out of the atmosphere, and also would indicate that the true peak of so2 may have fallen between the time markers in the so2 data. For example, below is the so2 levels of a mystery eruption that occurred around 6700 B.C. You can see, even two years after the initial eruption, the So2 levels were still as high as 375. This *could* have been the result of a separate large eruption, but I would be personally doubtful of this. Compare this to the very large Kurile Lake eruption in Kamchatka, which has a higher initial spike, but two years after, the so2 levels are much lower. If you look at so2 levels as having a sharp initial peak, then gradual decay, this would indicate that the true peak of the 6700 b.c. mystery eruption could have been much higher than the peak seen at Kurile Lake. What’s interesting to me is that the initial spike is smaller than the latter, indicating that the measurement probably took place before the so2 had fully dispersed and hit the polar regions. I somewhat expect that Kikai is the largest holocene eruption on earth. Sulphate peaks about 2 months after the SO2 injection to the stratosphere, and takes about 50 months to sediment out to pre-eruption levels. Final question about sulfate – I notice in more recent records that the global sulfate level has seemed to rise a bit, despite a lack of eruptions. It has been a bit more continuous you might say. Is this a result of industrialization? Does this actively play a role in suppressing global warming? Coal burning will do it. Dirty dirty coal. But the sulfate doesn’t even mostly get to the altitudes where it can mitigate warming, let alone in enough quantity to offset even the carbon in the same lump of coal, to say nothing of all the other carbon sources (oil, gas, deforestation…), and to top it off the residence time of sulfate is much shorter than that of carbon (Pinatubo’s cooling lasted a few years; Pinatubo’s CO2 will only be half gone after centuries). And of course the low altitude sulfate from coal burning has a well known nasty side effect, acid rain. It is a very scary thought indeed. Because one day it will be coming through in full swing. I have forgotten the percentage, but there was someone who calculated the effect of airplane contrails reflective ability and they stood for a fair percentage of cooling. I remember that american meteorologics found an extreme high temperature anomely the days after 9/11 when all airplanes were grounded, appearantly due to the lack of contrails. Can’t remember the numbers,. A tidbit about it in nature. The same effect of much clearer skies was seen in the UK at the time. Aircraft make a massive difference to the cloud cover. Over the north atlantic, 10% of cloud grows from aircraft contails. They make the nights warmer and days cooler, but on average probably make little difference. I think it was also seen when air traffic was stopped in 2011 but don’t have a reference for that – may be worth checking. The report you link to actually says that the average temperature did not change – the title is a quote from a politician which they rule is ‘mostly false’. It confused the change of minimum temperatures with the total change. While it isn’t really on the European continent, I do think that there’s also coffee plantations on the azores islands. The Weekly Update is UP! !